Craig Mitchell scored his first senior international try against Ireland at the Millennium Stadium in February 2013. Newport Gwent Dragons head coach Kingsley Jones says the region will sign Cardiff Blues prop Craig Mitchell. Speaking at a meeting with supporters at Rodney Parade, Jones also revealed Wales U20 stars Ashton Hewitt, George Gasson and Ollie Griffiths have signed new deals. They are joined by Matthew Screech, Cory Hill, James Benjamin, Keagan Bale, Dorian Jones and Connor Edwards. "These are important signings for us," Jones said. 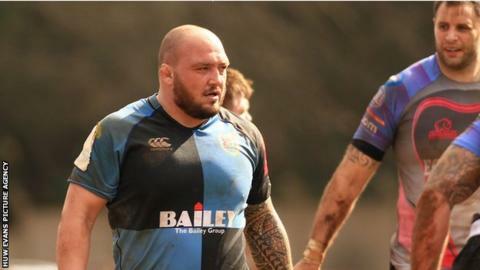 Prop Mitchell has won 15 caps for Wales and is a former captain of the U19 side. The 29-year old made his Wales debut during the summer tour of North America and Canada in 2009 and was part of the Six Nations squads in 2011 and 2013. He joined Blues from Exeter Chiefs in January 2014. Jones told supports that the Dragons are hopeful of keeping all their most promising players. "It is our intention to see our home grown talent at Rodney Parade," he said. "We are not expecting anymore players to be leaving us this season." Jones said the Dragons hope to tie Wales international Hallam Amos to a long-term deal.